The line-up for the Question Time session of the 2016 National Road Safety Conference is now complete with addition of three new panelists. Gavin Watts, vice chair of the CFOA Road Safety Group, Gary Rae, director of communications and campaigns at Brake, and Eddy Klynen from the Flemish Foundation for Traffic Knowledge (FFT) will accompany Road Safety GB’s Iain Temperton and Lembit Opik, director of communications and public affairs at MAG, who were confirmed earlier in the year. First introduced in 2010 and now one of the highlights of National Conference, the Question Time session takes the same format as the BBC show chaired by David Dimbleby. 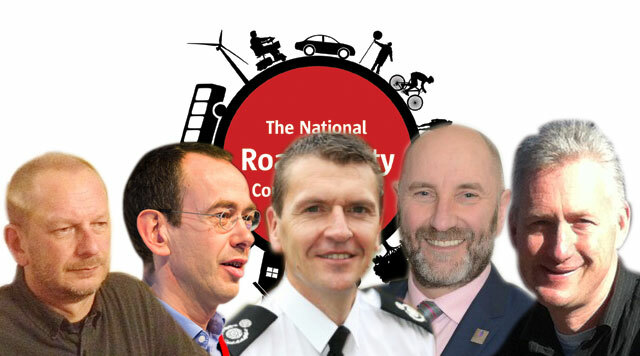 National Conference Question Time will once again be chaired by Nick Rawlings, editor of Road Safety News and one of the conference organisers, and delegates will be invited to submit questions in advance. Gavin Watts has been in the fire service for 27 years and is currently director of operations and assistant chief fire officer for West Sussex Fire and Rescue Service. His interest in road safety spans more than a decade and his road safety role with CFOA has given him a greater strategic understanding of the complexities of this invaluable work. Gary Rae has held a variety of senior communications roles in the public sector, third sector and government. He has advised politicians and chief executives on communications and change strategies. He brings that experience to Brake, where he is the director of communications and campaigns, heading a team responsible for proactive and reactive media relations, public affairs activity and policy and research. He drives a car, rides a bike and walks – but says that doesn’t make him a motorist, cyclist or pedestrian. Eddy Klynen is the general manager of the FFT, with responsibility for the walking and cycling in the Flemish Region. Eddy holds an advanced master’s degree in traffic knowledge and a master’s degree in law. He has been general manager of FFT since 1998 and is responsible for a team of 32 employees. Eddy, who will also present as part of the ‘Round-up’ session at National Conference, is also a lecturer in road safety in Asian and Latin American countries and at Hasselt University in Belgium.